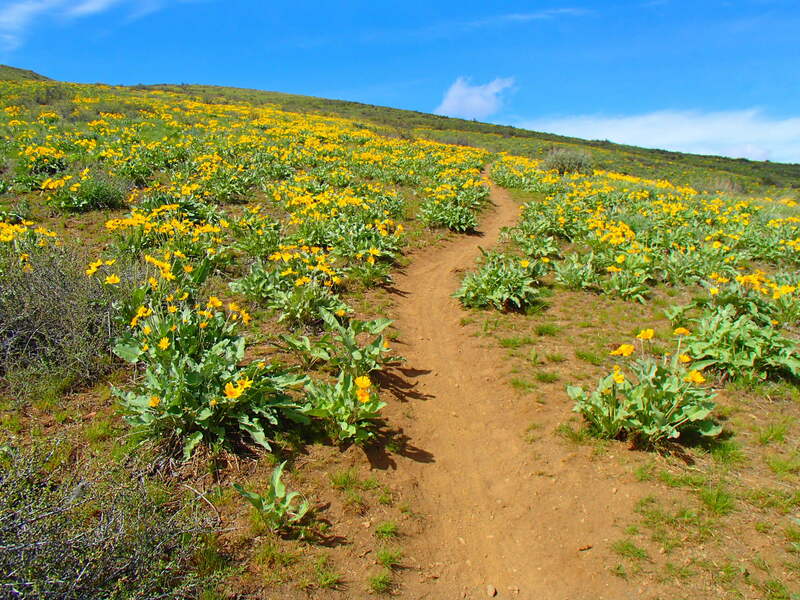 This short steep little trail is one of the first to open in the spring and has spectacular views of the still snowcapped North Cascades and wildflowers galore. It’s not real long, but it’s a great trail when you don’t have a lot of time. The trail starts across the street from the Riser Lake Parking lot. Cross through an opening in the barb wire fence and head up on the well-worn right hand trail. Note: the left double tracky type trail will also lead you up, or down, but it’s steeper, quite eroded and not as fun. You’ll get to the very obvious high point in 1.2 miles, without passing a single tree. Return to your car on the same trail. Driving Directions: From Cascades Outdoor Store in downtown Winthrop, turn left at the stop sign and go .6 miles. Turn right on the West Chewuch Rd. Go for .9 miles, taking a left on the Rendezvous road (dirt). Drive for 1 mile, turning left on Gunn Ranch Rd. After .8 miles you’ll see a parking lot on your left. Park there or on the road. The trailhead is across the street.